Mother, Father, and Rob went up in the country. I helped Bridget get the dinner and wrote a little to Vene in the afternoon and took a sleep. I got the supper alone. There was a rain last night but the weather today has been very warm. 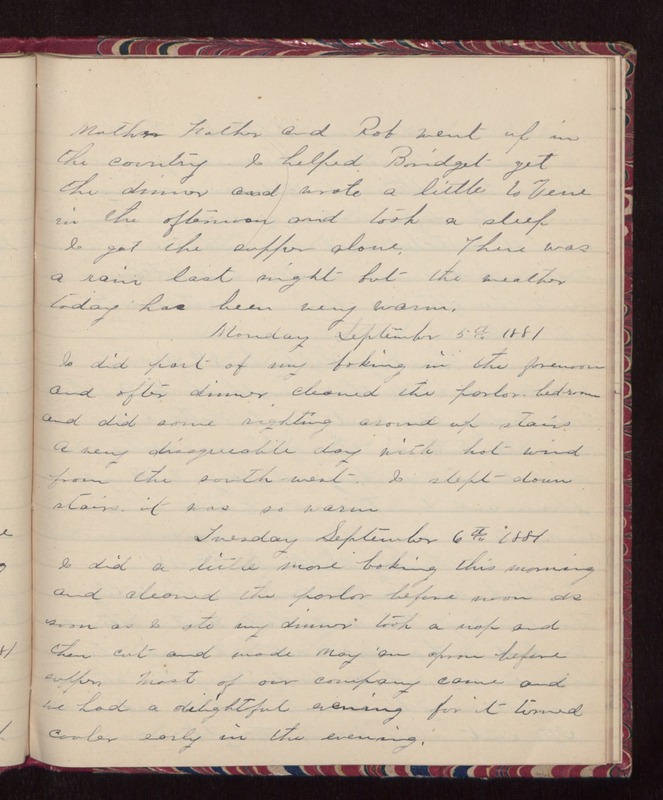 Monday September 5th 1881 I did part of my baking in the forenoon and after dinner cleaned the parlor-bedroom and did some righting around up stairs. A very disagreeable day with hot wind from the south-west. I slept down stairs, it was so warm. Tuesday September 6th 1881 I did a little more baking this morning and cleaned the parlor before noon as soon as I ate my dinner took a nap and then cut and made May an apron before supper. Most of our company came and we had a delightful evening for it turned cooler early in the evening.